Went to Celebrations near Ben Franklin Mapunapuna. Joy from Joy of Crafting was there doing a make & take. She made a cute and easy Back to School Card Case. Great idea! The paper is double sided and comes in several colors. Went to pick up these Greeting Farm Stamps from ManLe Hong on Etsy. 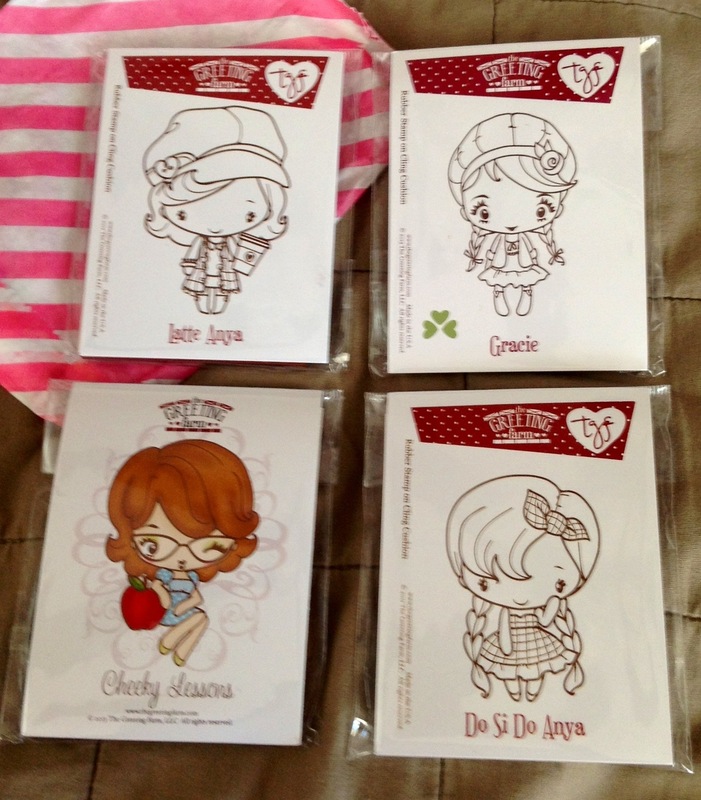 Here is Summer Emma from CC Designs Rubber Stamps. Made a Hello card using CC Designs Bling Emma. Thank you Wilma for some goodies for my recovery and belated birthday. She made a sweet card. Love your coloring. Where did you get the Happy Birthday inside the card? Is it from a Cricut cartridge? Wilma gave Cherries, Berries and Nut. Yummy! I can eat the cranberries and Joe will eat the rest. Of course I love my Hello Kitty. Look what I got. Went to Ben Franklin yesterday and saw these Hello Kitty Goodies. Green-Chocolate Chips Cookie Dough Treats. I am allergic to chocolate so I bought them for my hardworking co-workers. Had them try all three and tell me which one they like. They also told me something about all three treats. 4 out of 5 liked the Green-Chocolate Chips Cookie Dough Treats the most. The other person liked the Blue-Chocolate Brownie Treats. Thumbs down on the Pink-Sprinkled Cupcake Treats. This is what the box and actual item looks like. The Pink-Sprinkled Cupcake Treat does not look like the picture on the box. Some of the treats did not have a sprinkle on it. Tasted very sweet and gritty. Did not taste like a cupcake but tasted like frosting. The Blue-Brownie treats also did not taste like a brownie. The Green-Cookie Dough tasted like cookie dough. The middle was very sugary. This one was the winner. Each person took one box home with them. Hop on down to Ben Franklin and try these treats for yourself. Here is an awesome belated birthday card from Roberta. This is a Hello Kitty Pop-up Snow Globe. The Snow Globe that folds flat for mailing. Thanks Roberta. Where did you find this Hello Kitty? Carol made this cute card for the August Cricut Meeting. Theme for August ATCs was Back to School. Trinidad made this sunglasses card using the Impression Obsession die. Looks like she put Glossy Accents on the Sunglasses. She also gave me this bag that will be used as a trash container from Thirty One bags. Trinidad knows when I craft this bag will come in handy. My co-worker Eri went home in the summer and brought back some Hello Kitty gifts and other things for me. She put everything in this cute tote bag. My favorite color RED. Here is a very cute Hello Kitty card. I think I might be able to make Hello Kitty wearing a kimono. Here is an ice cream cone shaped dish. Papabubble candy and post it notes that her son bought but I’ve already used it. Thanks for everything Eri, I love my Hello Kitty. Received this Belated Birthday card from Sandy. So cute Hedgehogs from Penny Black. I like how she used the corner edge punch then had the ribbon strung through. That little flower punch is also cute. Sandy did you use the bling in the middle of the flower? I think the flower punch was from Cute Stuff. Love it!!! Thanks for giving me all the blings!!! Here is Marci from La-La Land Stamps. Finally got around to coloring her. Thank you Roberta for this Hello Kitty Get Well card. I want that teacup die. Did you see the origami butterfly? Roberta also sent a Hello Kitty Patch. Thank you, thank you, thank you Roberta! 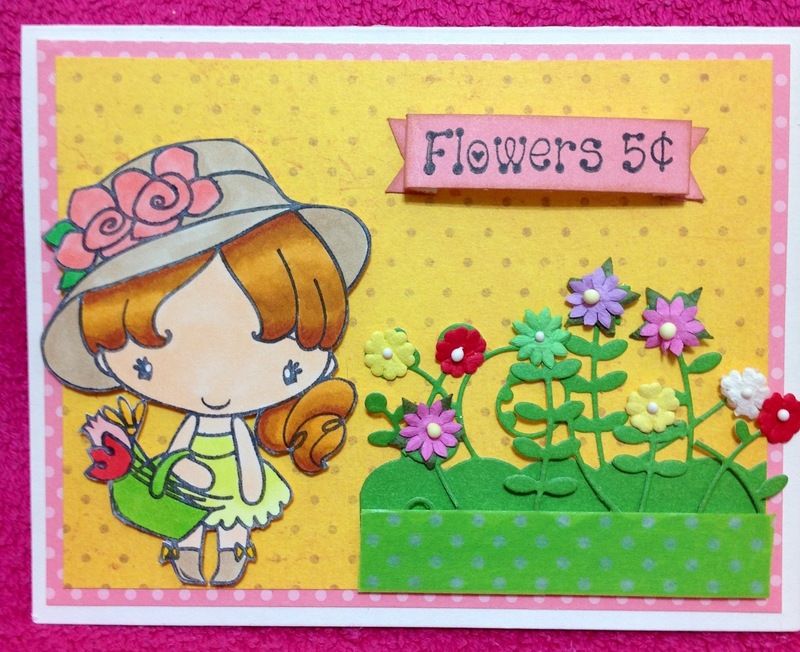 Used Garden Anya from The Greeting Farm found at Cute Stuff. Stamp found at Cute Stuff. Used the Memory Box Summer Border. 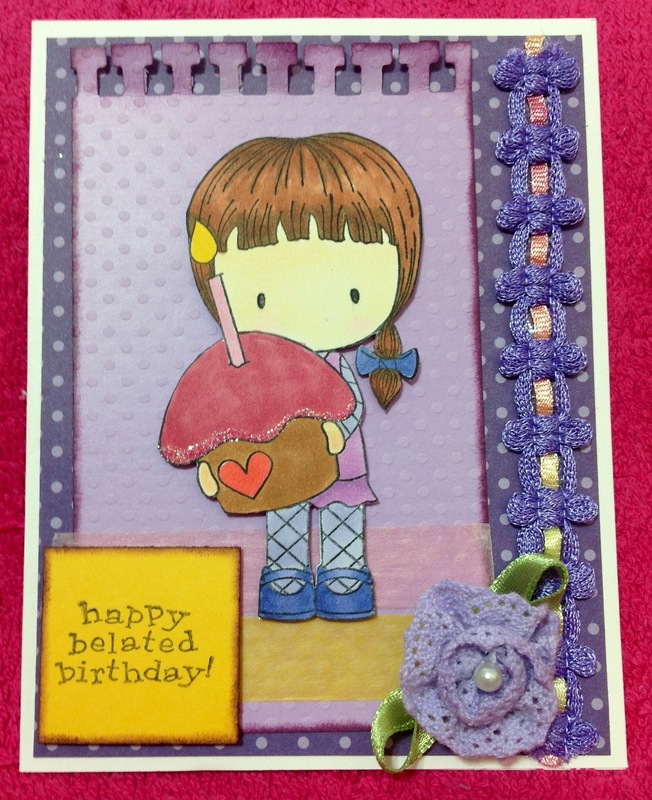 Made a very belated birthday card using Cupcake Cherrie from CC Designs. My friend really likes purple. Used the Fiskars punch called Notebook. Used distress ink by Tim Holtz called Seedless Preserves around the punched out piece. I store the dauber and ink in a ziplock bag. Each one of my distress ink has its own dauber. Used pink and yellow washi tape at the bottom of the card. The trim and flower is by Recollections. Anyone seen this brand sold locally? 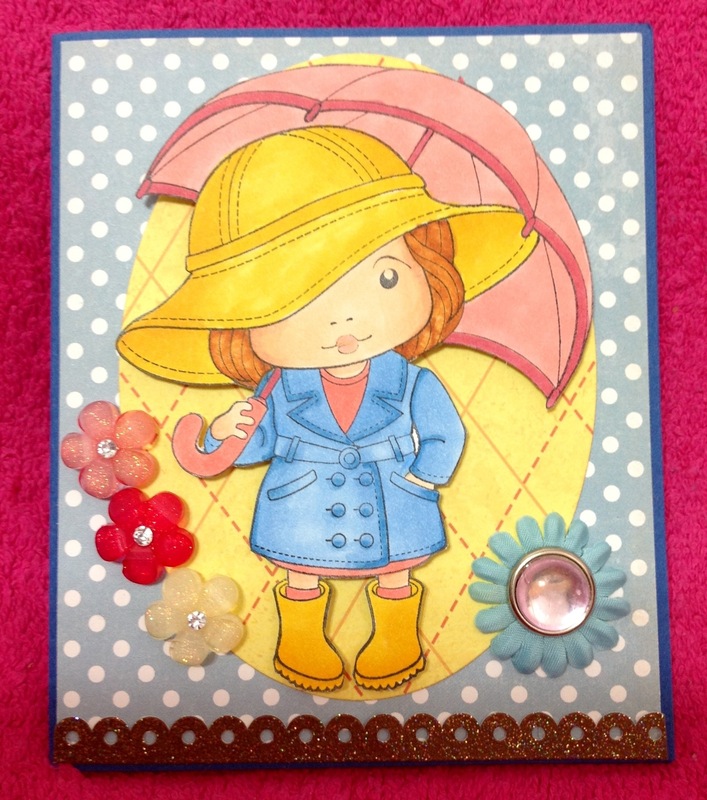 Sandy sent me this card using Cookie Emma from CC Designs. 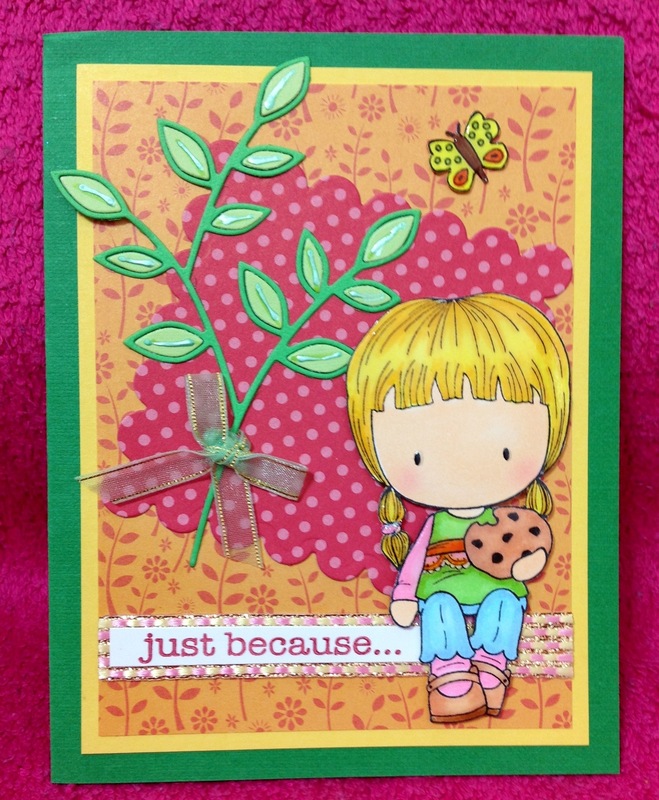 She used the Poppy Stamps Lorelai Leaf die. 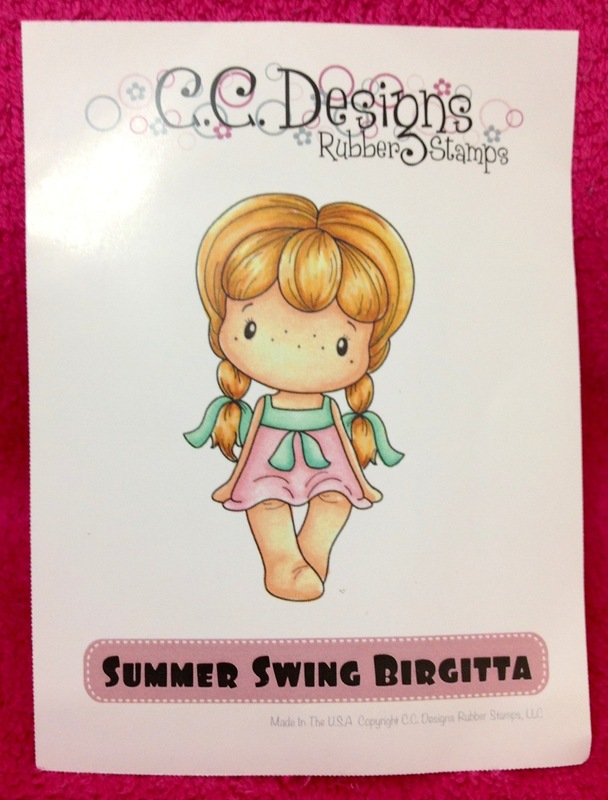 Used the Summer Swing Birgitta found at Cute Stuff released in July. Made a very simple card using washi tapes and buttons. My friend Sandy made another Get Well card. She used my favorite stamps from CC Designs Rubber Stamps. She used Cherrie with Rose. The Memory Box she used was Gwyneth Flourish. Sandy stamped the background with a matching color as the swirl. Take a look at this gorgeous card. Thanks Sandy for making my day!